Disclosure: I received a gift card to facilitate this post. All opinions expressed are 100% my own. I first learned about RetailMeNot at BlogHer 2011. They had a booth set up in the expo hall. Back then they weren’t in Canada. Things have changed four years later because RetailMeNot.ca is now here! I only recently found this out and immediately went over to check out their site. I know many of my US friends used the American site so I’m glad that I can now finally reap the savings here too. I immediately subscribed to their newsletter where they deliver the hottest Canadian deals and exclusive coupons right to my inbox. Let the savings begin! 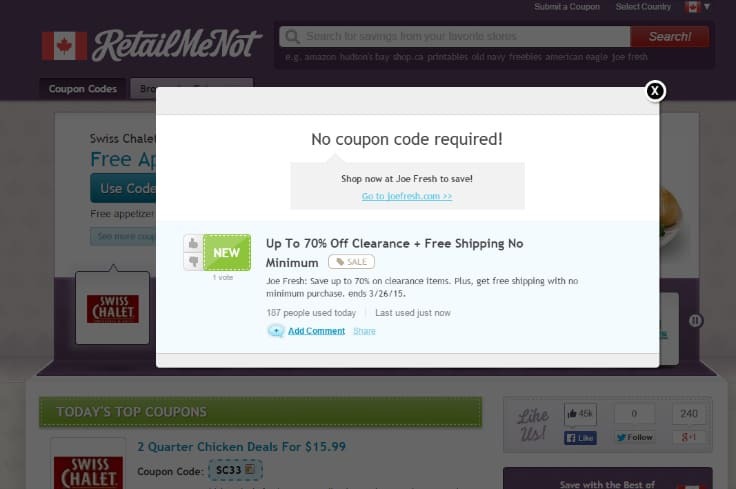 RetailMeNot.ca is a digital offers site that compiles the best in-store and online deals in one convenient location. Their goal is to help Canadians save money on whatever they are purchasing from clothes, beauty products, travel, books and more. They have many popular retailers that I already use for online shopping. I swear I shop at Staples at least once a month online for my office supplies. It’s great to see them on there so I can take advantage of coupons on my orders! I’m taking part in a fun blogger challenge right now where the goal is to see who can save the most money using RetailMeNot.ca on items we would normally buy. I was curious to test out the site and am always up for a challenge. I said bring it on! I was given $250 in VISA gift cards to spend on my purchases. I first looked around the site to see if there was any coupons that caught my eye. Immediately, I saw that Staples had an exclusive RetailMeNot coupon to save $30 on an order of $150 and up. I knew right away that was one I wanted to use. I was in need of more ink and paper for my printers. I go through a lot here each month! I also added in an extra mouse since I’m hard on mine and it’s always good to have a spare in case this one dies. 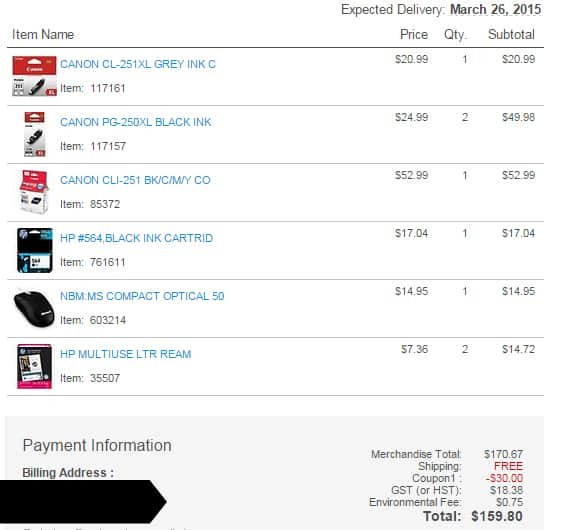 As you can see with my $30 coupon I’m getting one of my ink cartridges entirely for free and then some! Shipping is also free at Staples for orders over $45 and as you can see lightning fast shipping. I placed this particular order on March 25th. Delivery is expected TODAY. Another perk is that I also earned AIR MILES reward miles on this purchase. My next stop was Joe Fresh. I didn’t even realize that they had an online store until I saw it on RetailMeNot.ca. I used to buy their kid’s clothes when we lived near a Superstore. We don’t anymore so I wasn’t able to shop there. It’s good to know that I can still purchase Joe Fresh clothes online. I love how affordable they are! 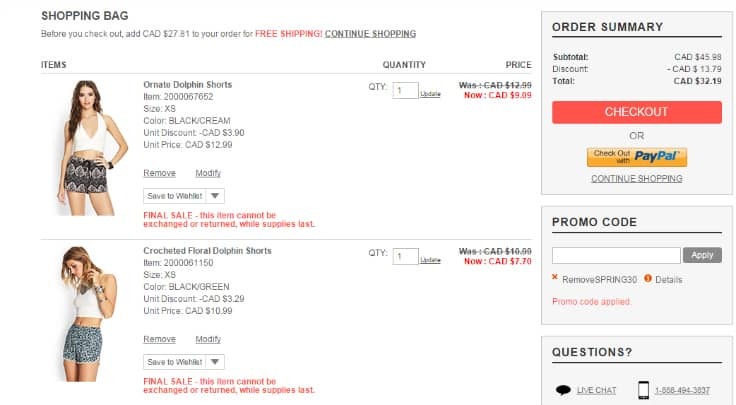 Joe Fresh was having a sale up to 70% off with free shipping and no minimum purchase. I didn’t need a special coupon for this one, but I never would have known about the sale had it not been for RetailMeNot.ca. I ended up buy Bridget some pants for the Fall and two pairs of shorts. I got a great deal! I still had money to spend so I asked Olivia to choose some items from her fave store, Forever 21. We’ve purchased here before, but I’ve never used a coupon there. Forever 21 Canada was had an amazing sale where you can take an extra 30% off sale items with a coupon code. The items were already discounted and now I was able to save an additional 30%! It was a “start the car” moment. I told her to pick stuff out as fast as she could so we could order before the sale ended! She ended up picking out two pairs of shorts and I also added in a shirt for myself. The sale is over now unfortunately, but if you keep an eye on RetailMeNot.ca you’ll be able to see when they have another one. The regular price for these three items (without tax) is $62.40. With the sale and my coupon code, the price is $32.19. That’s a $30.21 savings! 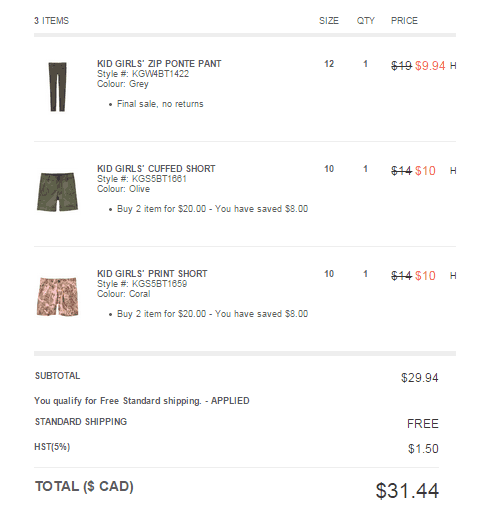 Forever 21 doesn’t have free shipping which is a bit of a bummer, but it was still worth it with the amount I saved. You can bet I’ll be checking for sales on RetailMeNot.ca the next time Olivia asks for clothes! I made a spreadsheet to sum up my purchases. The regular price of my purchases was $280.07. With the sales and coupons, I only paid $202.80. I saved $77.27! My VISA Gift card had $10.01 remaining on it. I think I did pretty good! What do you think? 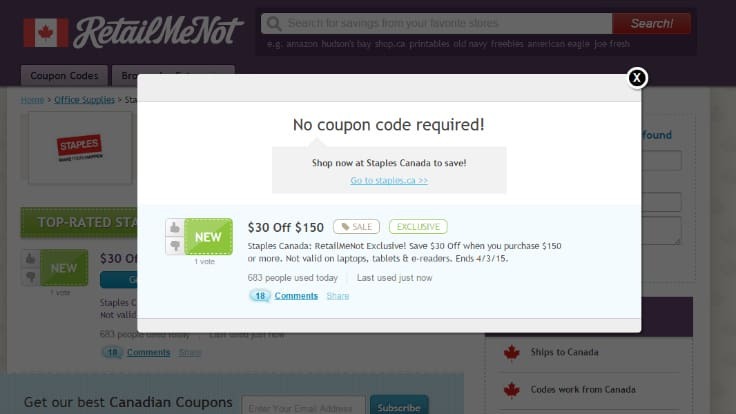 You can browse by coupon codes or by categories on RetailMeNot.ca and discover hot sales and coupon codes. Be on the look out for exclusive coupons like the one I found at Staples! Connect with RetailMeNot.ca on Facebook, Google+, Pinterest and Twitter. The Amazon Easter deals up to 70% off appeal to me. I love shopping on Amazon! The Best Buy clearance sale! Staples $15 off $100 coupon as I buy my toner from them. I was interested in the 30 off 200 prchase from Staples! Babies R Us. My little guy is turning 1 next month and there’s so many cute things at BRU I can get! The Canadian Tire Spring Mega Sale – up to 75% off on select items. The Porter Airlines offer really grabbed me … I booked through a travel agent a few days ago on this airline and it was shocking to see what I COULD HAVE SAVED! Canadian Tire Spring megal sale up to 75% off! Spring Mega Sale – Up to 75% Off at Canadian Tire caught my eye. Staples $30 off $200 or more – I needed to buy something & this will help! Thanks! Up to 70% off sale items at The Body Shop; sweet! Staples $30 Off Purchase Of $200! The 75% off Canadian Tire Megasale is interesting to me!